WAKE UP MORINGA STRONG! Want to buy it online but want to read... – Juka's Organic Co.
Want to buy it online but want to read more about it first? Moringa powder is extracted from the tropical moringa tree, namely the moringa oleifera species. Although it is now harvested in many parts of the world, it is native & indigenous to Africa. Many Ancient Africans used moringa leaves in their daily meals & often cooked this superfood as the southerners cook collard greens in the U.S. It is particularly use in villages that don’t have access or money to buy meat due to it being a high protein plant. Because of its potent nutrients, it has kept villagers that consume it nourish & healthy even with insufficient food. It is now widely used in many parts of the world because of its known health benefits. Some of the many benefits include, high in protein, vitamin B6, vitamin C, iron, vitamin B2, vitamin A, E & K, magnesium, amino acid & fiber. This makes it the superfood of Africa. But you must get the real deal to enjoy the health benefits. 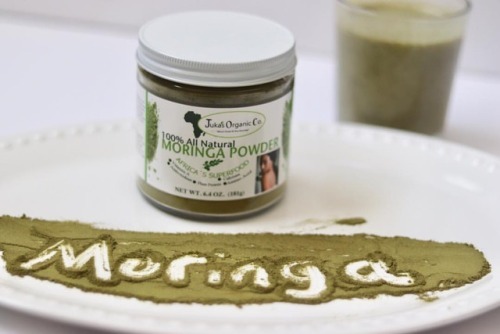 ON THAT NOTE, BUY JUKA’S ORGANIC MORINGA POWDER, ITS THE BEST IN THE MARKET LIKE EVERY PRODUCT WE CARRY. 24% Fiber A Very Rich Source Of Iron, Vitamin K & E. And A Source Of Vitamin A & Calcium. Super High Plant Protein including All 9 Essential Amino Acids. High in Antioxidants Which Helps The Body To Fight Inflammation. Juka’s Organic Moringa Powder is Ethically Harvested By Small Scale Women Farmers We Have Partnered With In Villages Of Africa. Visit us at www.jukasorganic.com to buy it and start your Moringa journey.